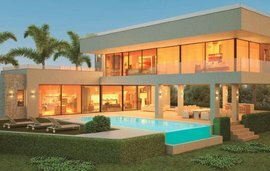 Show flat now openThis residential development is located in the municipality of Benahavis, situated on the top of the hill with views over the Los Arqueros Golf Course, the sea and mountains. 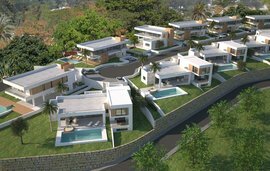 This residential development is located in the municipality of Benahavis, situated on the top of the hill with views over the Los Arqueros Golf Course, the sea and mountains. This complex has been created with the principle of sustainability, ecology and bioclimatic architecture. The buildings have been constructed on different levels in order to be able to enhance the views of the surrounding areas. The complex will comprise in total of 92 exclusive apartments and the first phase of 42 units comprising of 3 bedrooms, 2 bathrooms apartments have just been released onto the market, construction has just started and completion is expected in July 2018. Built by one of the most reputable developers on the coast these apartments are expected to sell out quickly. They will have top quality designs and fittings with large living areas, large windows to make the most of the light, open plan layouts with a modern finish. All apartments have 3 bedrooms and they have large terraces, all will be south facing so that you can make the most of the sun throughout the day. The penthouses at the top of the 4 storey buildings will have a spectacular solarium so that you can enjoy the views. The interior layout is extremely modern, integrating the kitchen with the living area and terrace. The apartments will have cream coloured marble throughout, large tiles in the bathrooms, wide patio doors, top quality kitchen appliances and sanitary fittings, LED lighting, air conditioning and heated flooring in the bathrooms. What makes these apartments so alluring is the minimal energy consumption as they have been designed to protect the environment by using solar panels, high quality thermal insulation and sound-proofing and will have a B rated energy certificate. The apartments are built in a gated and private community with 2 swimming pools and beautiful garden areas. A private parking space and storage room are included in the price.